The official PC system requirements for DICE’s Battlefield 4 have been released and showcase that the game would be able to run on current mid-end cards in 1080P resolution. DICE’s Battlefield 4 which is being made using the Frostbite 3 engine is a pure next generation online FPS experience backed by powerful integrated tools such as Battlelog 2.0. PC being the lead platform for Battlefield 4 and all of DICE’s Frostbite engine based games has been optimized for the PC hardware. The settings show that gamers on 1080P screens would be able to enjoy the game with a sub-$250 US GPU such as the recommended Radeon HD 7870 and NVIDIA GeForce GTX 660 with 2 GB VRAM and 3 GB if you want to play on higher details and resolution of 2560×1440/2560×1600 for a more premium experience. The CPU recommended for running the game in max details require an Intel Quad Core and AMD Six Core CPUs. This means that an Intel Sandy Bridge based chip would be enough to run the game with maxed out details since Battlefield games have always put the load on the GPU more than the CPU. On the AMD side, anything from a good old Phenom (six core) or AMD’s FX-6000 range would be able to run the game fine. The system memory required to run the game adequately is 8 GB which has become pretty common in most of the gaming PCs and the memory prices are relatively cheaper at the moment so you can upgrade to 8 GB for a price below $50 US easily unless you are aiming for high frequency rams. The hard drive space required for installation is massive this time around requiring 30 GB of free space for the game alone. So it would be better to make some space before downloading the game off Origin. The game would obviously run much better than the Alpha version detailed a few months back. You may have noticed that its mentioned under the recommended specs that Windows 8 is required to run the game. Both Windows 7 and 8 are fully supported but its the DirectX 11.1 features that would only be available on Windows 8. Overall, the game looks absolutely great and would be optimized for PC hardware at launch and a bit exclusively for AMD hardware. 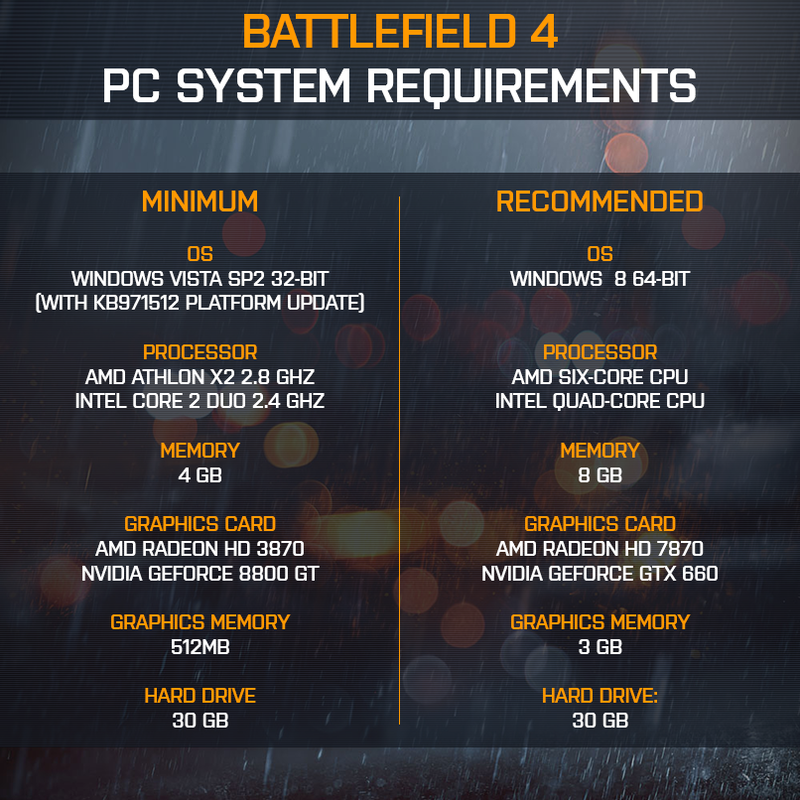 Battlefield 4 launches for PC on 29th October 2013. The BETA is expected to be released in early October. Consoles version would also be available at the same date with next generation console releases arriving later. It was revealed that the next generation consoles have graphics which are comparable to medium settings on the PC version and run at native 720P resolution upscaled to 1080P delivering 60 FPS.